Miami was the place to be this weekend for the annual BET Hip-Hop Awards. Who are your favourites? Two for me, Neons vs. Nudes. 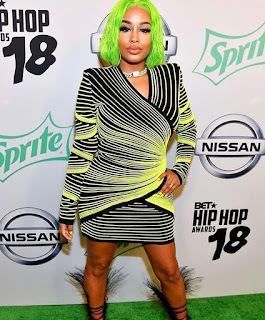 Rapstress Dreamdoll rocked neon green tresses in a Balmain dress and YSL feathered heels, whilst Blac Chyna looked stunning also in a dare to be Vintage dress. I am in love with both looks. Fire.